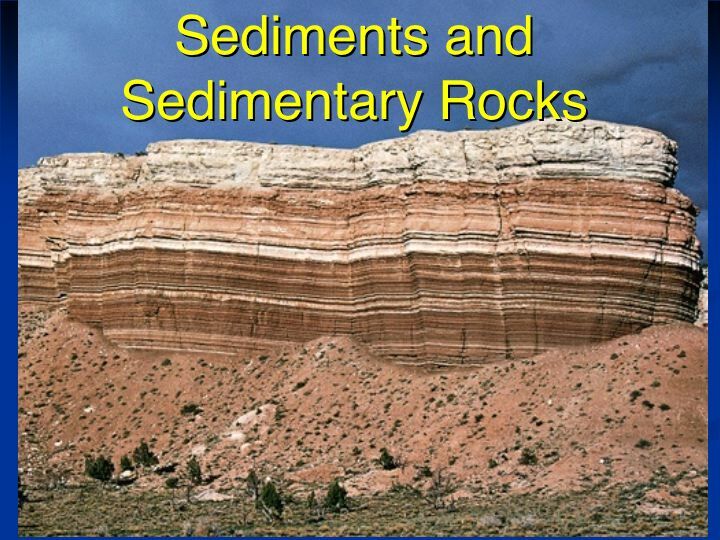 Sedimentary rocks are rocks which are formed by the accumulation of sediments, subjected to physical and chemical processes (diagenesis), give rise to more or less consolidated material. Can be formed on the banks of rivers, deep ravines, valleys, lakes, seas, and at the mouths of rivers. They are arranged in layers or strata. There are external geological processes acting on preexisting rocks and weathered, transported and deposited in different places depending on the transport agent (water, wind, ice). Similarly, various animal and plant organisms can contribute to the formation of sedimentary rocks (fossils). Sedimentary rocks may be up to a depth of ten kilometers in the crust. These rocks may occur loose or consolidated, ie which have been bonded to each other by sedimentation processes subsequent to, known as diagenesis. Sedimentary rocks cover more than 75% of the earth’s surface, forming a sedimentary cover on a base formed by igneous rocks and to a lesser extent, metamorphic. However its total volume is small, especially when compared with the igneous rocks, which not only form the greater part of the cortex, but the entire manto. On the rocks exposed external geological processes act as weathering, erosion, transport and sedimentation caused by solar power and causing the destruction of the relief. The first two processes worn rocks and break into smaller and smaller fragments, known as clasts or debris, which are carried by rivers, wind or glaciers, to be deposited in sedimentary basins, usually the bottom of seas and lakes; there is a relationship between the fragment size and the distance traveled, so that the smaller the greater the distance clasto walking and vice versa. Serpentinite particles found in greater numbers, followed by breach andesitic, quartz and finally coal. We have to say that the non-metallic particles that we have described are not the sand that is on the beach of the river but the water carries sand in the river bed. We find large pieces of these rocks in the bed and small pieces from 10 inches in diameter to as small as 0.2 mm in diameter. Continuing sedimentary rocks in general and have a better idea, we turn to the following, specially in detrital sedimentary rocks and deposits which is the most interesting in case of what is taken place in the Motagua River. Detrital sedimentation occurs as a result of the energy loss of the transport means, which makes this interruption, whereby physical particles which tend to be deposited are carried by decantation. Originate and sediments, and from them, and through the process of diagenesis, clastic sedimentary rocks. Between them, rocks and sediments, the most common are the sands and sandstones and argillaceous rocks (shales and siltstones). In addition, these materials often contain minerals mining interest that are deposited together with the rest of the rock (if placer deposits), or introduced into the same advantage its high porosity and permeability (in the case of water, oil, natural gas). The larger than 4 microns usually mineral grains, among which the most common are quartz, followed by feldspar and lithic fragments. In detail, in regard to the nature of the mineral grains, the possibilities are almost limitless: grains of other silicates (mica, pyroxene, amphibole …), oxides (magnetite, ilmenite, chromite …) even of native metals, like gold, these grains traveling away by the wind or water, or as suspended load in background, and to reduce transportation energy deposited almost immediately (physical processes: Decanting). These particles we call clasts. The size of less than 4 microns usually correspond to clay minerals, and in this case the transport occurs in colloidal suspension, which means that they can continue to be transported even through rough waters. The reservoir in this case is produced by the physical-chemical process of flocculation can take place jointly and simultaneously with the physical deposit of the particles, or subsequently in quiet zones. In the first case the matrix originating clastic rocks, ie the thin intergranular component, clay and conglomerates of sand or sandstone, while the second gives rise to the argillaceous rocks (shales, mudstones). The main distinguishing character of sediments and sedimentary rocks is their grain size. Specifically, the scale used is that of Wentworth, that difference between varieties thick, diameter greater than 2 mm (gravel, conglomerate, conglomerates, breccias), the intermediate-grained (sands and sandstones) of diameter between 2 mm and 64 mm, and the fine grain, between 64 and 4 mm, corresponding to the slimes and siltstone. Another important character is the nature of the clasts, especially the larger ones: when we talk about rocks varied polymictic, whereas if to a type correspond mainly talk about rock lithology oligomíctica. As major components in the cluster can have rock fragments generally quartzite or carbonate, but may consist of rocks much more varied in nature, in the sands or sandstones the most common component is quartz, feldspars generally accompanied. They are also relatively frequent called bioclastic sands and calcareous sandstones, formed by the accumulation of shell fragments of bivalves, gastropods, etc.., In coastal environments (beaches). Also often the subject of interest the degree of evolution of the clasts, which results in their way: the most immature often angular and low sphericity, while the more advanced, the more distant we found the source area, are often much more rounded and high sphericity, due to the abrasive effect of transport. The fact that the case of loose sediments or unconsolidated rocks and also marks a significant difference: the gravels and sands are loose materials, while the clusters (or gaps) are compact rocks and sandstones, in which grains or clasts are more or less firmly cemented. In the finest varieties, unconsolidated sediments are called silt, clay or shale, while the rocks are called siltstones or claystones, or, when they develop a certain foliation, crush, slates. · The loose gravel, especially on the banks of rivers, or scree slopes, are used as construction aggregates, whether buildings or public works in concrete, mortar, or asphalt binders, etc..
· The same use are some loose sands, mainly in cement or lime mortar. · As for the rocks already consolidated, well cemented sandstones have also been used in construction, as “stone cutting”, due to its easy styling. However, it is often very problematic rock for its changeability. · Other uses of the purest sands and sandstones (silica sand) are in the industries of glass and silicon. · Meanwhile, clayey varieties are mainly used as raw material in the ceramic industry. In this case, the nature of the minerals that make up these rocks and their textural and structural characteristics to define their best use in a wide range: brickwork, structural ceramics, tiles etc. · The slates, meanwhile, as intermediate between rocks from sedimentary and metamorphic shale consolidation, are used for roofs (the highest quality) and rustic flooring and baseboards (the lowest quality). Certain minerals of economic interest that make the rocks are very resistant to physical and chemical weathering, but often in these rocks is not profitable to mining. This is due to two factors: its low grade therein, and the need for a complete exploitation of the rock, further comprising a concentration process often problematic. In placer deposits of naturally occurring separation and concentration of these minerals in unconsolidated sediments, which very considerably cheaper mining exploitation. Moreover, as in the previous case on one side we have the pleasure in recent sediments from beaches or river systems, and the other, called paleoplaceres, fluvial sedimentary rocks or coastal detrital may contain concentrations of mineral or minerals mining interest. The first surface is operated by direct starting and charging, while the latter will require a higher cost mining either open pit or underground. The separation of the mineral phase of economic interest takes place as a result of weathering differential rock forming minerals. As we already know, and depending on weather and climate factors, this process causes the rock to shatter, destruction of some of its mineral components. Those that are not destroyed, being resistant to weathering existing in that area and geologic time, are carried by water or wind, ie, mobilize, go to suffer the transport process. It is important to emphasize that the fact that a given mineral is not dependent meteoric or external conditions prevailing in climate or the composition of the atmosphere. The concentration of the mineral takes place as a result of their difference in density compared to other minerals carried by the means of transport: these minerals are usually metal, so that its density is much higher than the rest. This conditions that focus on specific points of the river course (figure), or that the wind drag stop before the rest, or to concentrate preferentially in certain points of a beach. As we often find minerals forming these deposits, we have to mention first the native noble metals: gold, silver and platinum are undoubtedly the best known. 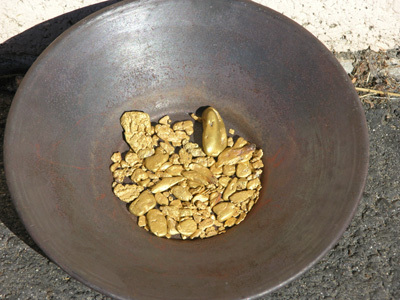 In this case also, in particular gold grows to give rise to the nuggets, increasing in size with the degree of progress along the transport. Other common minerals in these deposits are: cassiterite, ilmenite, rutile, monazite, garnet, among others. Also some gemstones, like diamond, ruby ​​or sapphire, can appear in such fields. 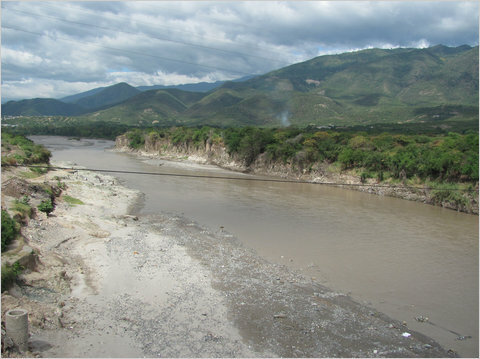 In another article we will see how they travel sediments in the Rio Motagua, which is formed from the beach, carrying amount of water, among other things, related to this type of sedimentary rocks and sediments that are also relevant to the igneous and metamorphic rocks.